I learned while researching this blog topic of tadpoles that the ancient Egyptians used the image of a tadpole in their system of hieroglyphics. I thought it was pretty cool that the tadpole made it into the sacred carvings of this ancient culture. The image of a tadpole was drawn to represent the number and quantity of 100,000. I wondered why would a tadpole be used to represent this massive number? How did ancient Egyptians relate such a massive number to a puny tadpole? And then I remembered the plagues…. The Egyptians endured some doozy like plagues, including a plague of frogs. I realized that Egyptians must have experienced absolutely massive numbers of tadpoles filling the shorelines of the mighty Nile, and it made a bit more sense how a single tadpole could represent such a massive number; as well as representing fertility and proliferation. Tadpoles just got even cooler to me! Tadpoles, or pollywogs as I called them as a kid in Georgia, are the metamorphic offspring of frogs and toads (salamanders, and newts too!). Tadpoles congregate in huge schools as they develop and can easily take over some ponds for a few weeks every year. A tadpole is the larval stage between egg and adult frog, and vary in sizes quite a bit depending on the type of frog or toad. They only live in the water during this stage and breath with gills, but are still considered amphibious. Tadpoles have large heads in proportion to their bodies with 2 eyes and a small mouth, no legs or arms, and a long broad tail that they wiggle to propel themselves through the water. Their coloration can range from deep black to grey/green and their skin is very slick. And there is no mistaking them when you see them. For pond keepers frog egg sacks will typically be found along the edge of your pond. Egg sacks are rounded and look like clear tapioca with little black dots. Tadpoles can be found in your pond just about everywhere once they hatch. I’ve seen them embedded in algae growth, hanging around lily stems, free swimming. They mostly stay in schools stay in shallower areas and crowd into the edges of ponds. Tadpoles enjoy basking in the sun, but they will be quick to scatter, with some pretty impressive bursts of speed. You’ll see them sitting in lily pots and other plant containers. Large koi and other large pond fish may try the “pollywog du jour” for an occasional meal but they won’t make an impact on population counts. The other usual suspects such as the heron, raccoon, snakes will also make meals of the tadpole when the opportunity is there. Pond keepers should enjoy this incredible fleeting display of nature happening in your backyard. 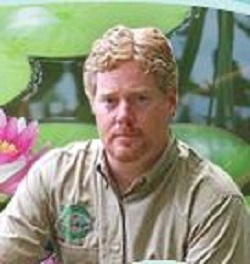 Pond keepers should also be paying attention during this time for filter intakes getting plugged up (yikes), or tadpoles getting sucked into pumps (yucks). They can even get into skimming systems, but like fish, they seem to know not to go there. They don’t need any special care or feeding in a backyard pond setting, tadpoles are fully self sufficient. The tadpole stage of a frogs metamorphosis begins at about 1-3 weeks when the frog egg hatches. After hatching the tadpole will live off of the egg yolk for a week or so, and then begin to swim and live off of algae growing in the pond. Around 8 weeks old they are developing legs and arms, at the same time the long tail is getting smaller and smaller. Tadpoles look really cool at this time being more like a tiny frog with a long tail. By 12 weeks they have become frogs and begin leaving the water, develop lungs, tougher skin, and that big ol’ frog mouth! For pond keepers that enjoy having all these proto frogs and pollywogs boppin around the pond you may be disappointed that of the hundreds, maybe thousands, of eggs laid in your pond only a very small fraction of adult frog would reside at your pond. Frogs are mostly solitary critters, they move on; or have other fates like making that once in a lifetime mistake of asking a blue heron for directions. Tadpoles have been around for millions of years and today’s pond keepers are helping that to continue. We often hear about the massive habitat loss and die off of frogs around the globe; of course these losses extend to tadpole, but tenfold. 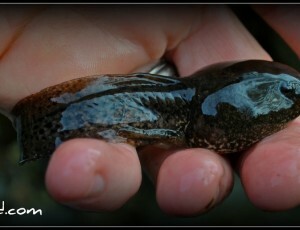 Tadpole season is a multi-week experience that signals Spring is here., but Summer is coming soon! Backyard pond keeping is an effective way to help increase habitat and conserve numerous local species; so enjoy the tadpoles and share the pond keeping lifestyle with your family and friends. I have a smallish two tiered fountain in my side yard. I haven’t maintained it at all. We have had a lot of rain here (south OC CA) and there is algae starting to grow in it. Is my fountain too small or a bad place to put tadpoles in? My boys would love to have frogs bouncing around and to try and catch tadpoles. Hard to do that here for kids nowadays. If the fountain is a bad idea…obviously I wouldn’t turn it on…what do you recommend. A tank/aquarium? A barrel? We also have a lot of slugs eating our homegrown strawberries and maybe it would help with that problem? We have huge tadpoles in our FLA pond. They are not getting legs at all. Are they useful for cleaning the pond? Guessing they are bullfrog larvae but they have been around for about a year. There are a large number of developing tadpoles in a very small backyard pond at my father’s home. We have fed them and there are probably 100 of them, some beginning to develop legs. There is a stream on the property, but it is about 200 yards from the pond. Should we move them there, or let them find their own way? I have a pool that I intend on turning into a rainwater reservoir this year. I had it drained it and now it has a couple of feet of water filled with a melodious group of troubadours. I have a conundrum! I don’t want to drain the oool again until the tadpoles have a chance to become frogs and leave on their own accord. And I do not want to contribute to the spread of the Zika Virus. Your thoughts? Do tadpole eat koi fry or eggs?